According to the U.S. Bureau of Labor Statistics, around 99,820 CNAs were employed in the state, as of May, 2013. The employment per thousand jobs was 11.56. New York is the second top paying state with mean annual and hourly salary $32,130 and $15.45 respectively. The average CNA income in NY, in January 2015, was $33,000 which was 36 % higher than the average national salary for job postings, as per the statistics provided by indeed.com. 90% of CNAs made less than $42,770; 10% made more than $42,770. 75% of certified nurse assistants earned less than $37,170; remaining 25% earned more than $37,170. 50% of the employees earned less than $32,700; rest 50% earned more than $32,700. 25% of CNAs were paid annual wages less than $26,490; 75% were paid more than $26,490. 10% of employees received less than $21,640; 90% were offered more than $21,640. 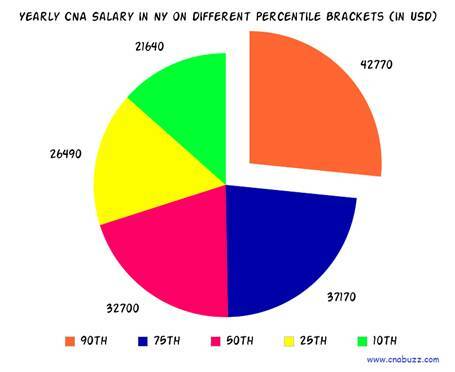 Work settings and geographic location indirectly influence the salary of a CNA. Other than this, the experience, education level, and work type is also counted. Bronx, Brooklyn, New York, Queens Village, Staten Island were the highest paying cities with median annual salary $36,240 and median monthly salary $3,020. Binghamton was the lowest paying city with median annual salary $28,279 and median monthly salary $2,357. A wide array of CNA job titles are conferred in the nursing field, according to the experience of a nursing assistant. These titles not only bring responsibilities but also offer a heavy paycheck. For instance, CNA Hospice was the highest salaried professional with a pay of $43,000. Correctional Prison Facility CNA received the lowest salary of $21,000. Salary for other designation ranges between $22,000 and $40,000. The job growth rate for certified nursing assistants is anticipated to be increased by 21 percent in the coming years (2012- 2022 decade), as per the U.S. Bureau of Labor Statistics (BLS), which means that approximately 312,200 new positions will be generated for the CNAs. However, this field has limited advancement opportunities, high physical demands, and low pay; therefore, many nursing aides are likely to leave their jobs to pursue higher studies. Question 1 – How much do CNAs earn in New York? Answer – In New York, CNAs can expect a salary of $33,000 per annum. Question 2 – Since the cost of living is high in NY, what job title should I target to earn my living? Answer – CNA Hospice is the highest paid job title with annual salary $43,000. Other top paying job titles are CNA Rrmc ($40,000), Medical Assistant Family Practice ($40,000), and CNA Medical Surgical ($37,000).